I know, I know. Once again this is just a little late. But it is the last post before I am all caught up. My brother Jim, and his wife Annie, live in Austin, Texas. We convinced them to temporarily abandon the wonderful summer weather in Texas and come visit the rainy northwest for the Fourth of July weekend. 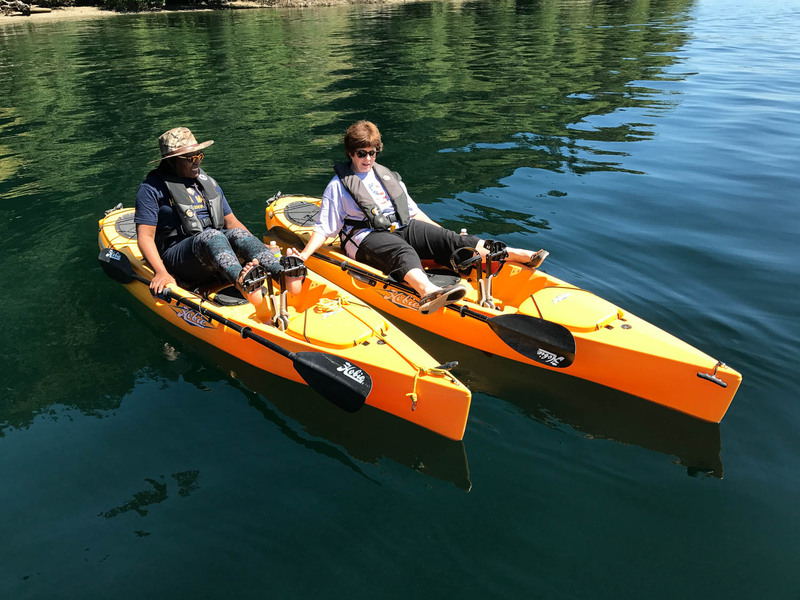 The plan was to take them to Blake Island on the second, and then on to Poulsbo for the Third of July festivities. And that is just what we did. The weather was fantastic. 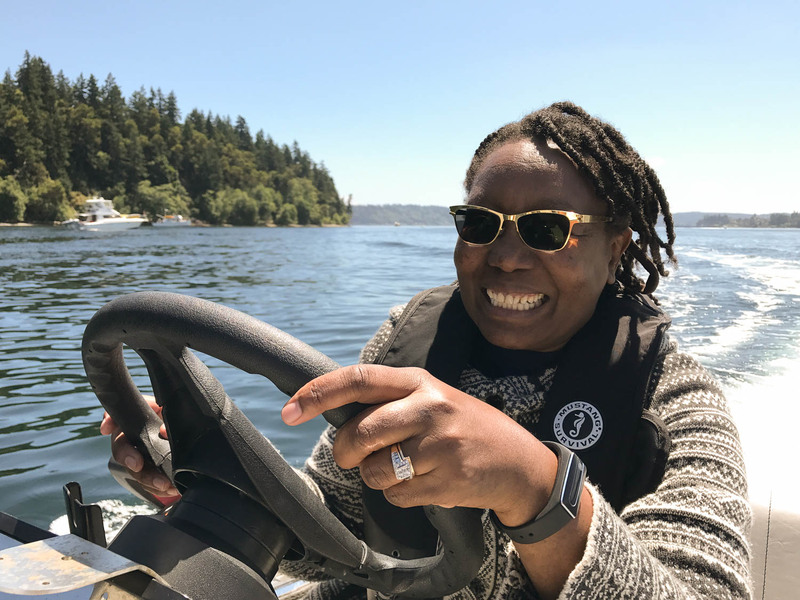 We motored down to Blake Island and anchored on the west side of the island. Annie is from Kenya. Boating was an entirely new experience for her. Being the kind and gracious hosts that we are, we threw her in to the deep end of the pool, so to speak, right away. We showed her how to drive the dinghy. We took her kayaking. No one got wet and everyone had a good time. We made Phyllo wrapped tarragon chicken for dinner. Had a nice bottle of wine, and a relaxing evening. Perhaps I can talk Kim into posting that recipe here. It’s easy and tasty. And it can be made in advance and frozen. Perfect for the boat. The morning of the third, we headed back to Liberty Bay to get a great spot for the fireworks that night. We ended up about 200 yards from where the fireworks barge would tie up. Not bad. As usual, with the nice weather, there were many boats in the bay. All shapes and sizes. This picture is from earlier in the day. 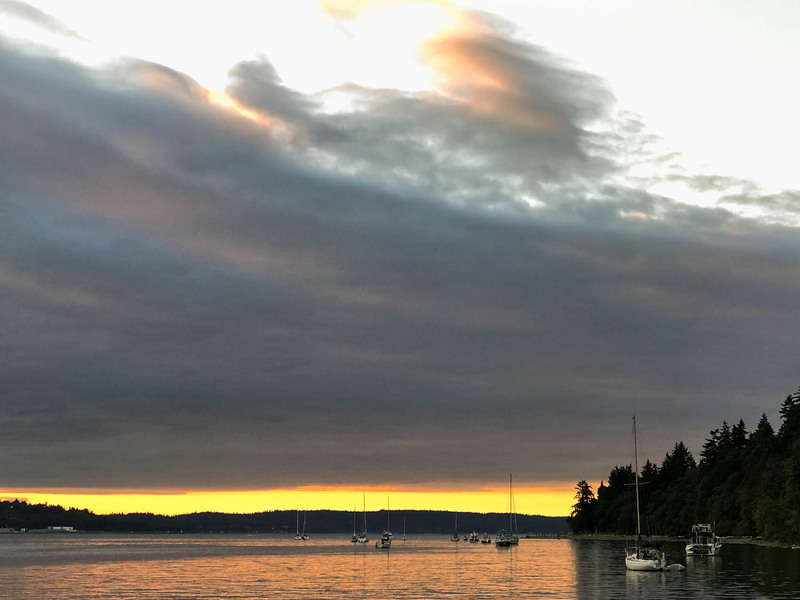 By evening, there was little room for anchoring close to Poulsbo. In the afternoon, Jim and Annie went exploring in the dinghy while Kim and I lounged around on the boat. Annie looks relaxed here. Jim did all the hard work. Dinner was hamburgers on the BBQ. Hatch green chilis in the burgers. Yum. The fireworks were great. As usual, the show was all around us. Lots of fireworks were launched from shore around the bay both before and after the official show. The morning of the fourth, we motored all the way back to the Liberty Bay Marina. That took about five minutes. Another fun excursion and holiday on the boat. 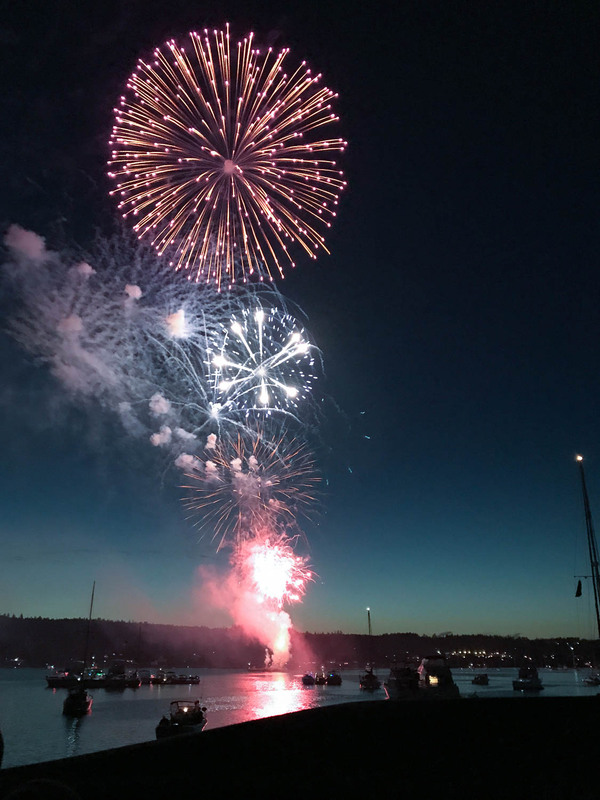 This entry was posted in Destinations, Friends, Interesting and tagged Archimedes, Blake Island, boating, Fireworks, Fourth of July, Grand Banks, Grand Banks 42, hobie, hobie mirage, Hobie Mirage 11, hobie revolution 11, Liberty Bay, Pacific Northwest, Poulsbo, Puget Sound, Salish Sea, Seattle, Third of July by Rusty. Bookmark the permalink. We took the small boat loaded with grandchildren to the back bay in Newport Beach CA and had the best time. 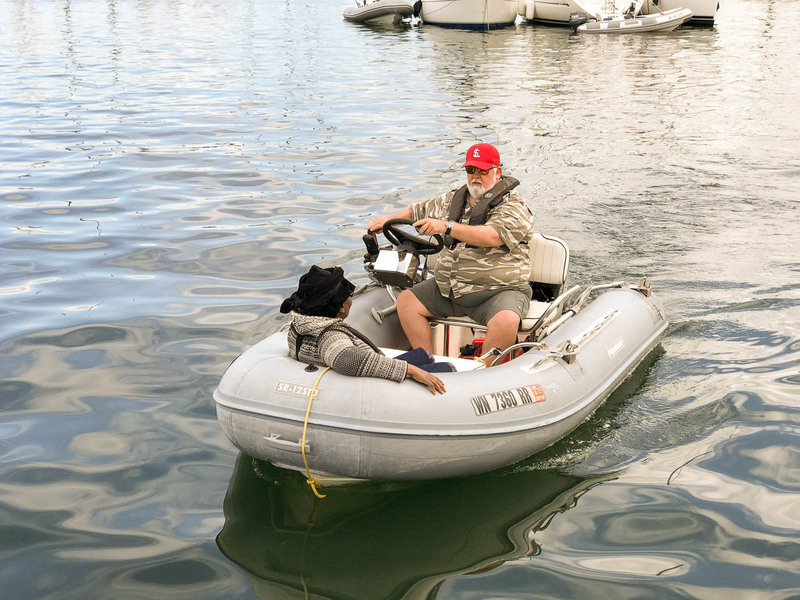 It is always a bit iffy whether someone unfamiliar with boating will take to it. Enjoy it, not get queasy or ill, and so on. And of course good weather is always nice. Not always reliable in this area. So it is nice when it all works out. And the fireworks are always fun.